Stress management education can seem overwhelming, especially to people who are under a great deal of pressure. Instead of lecturing the ways in which people can manage stressful situations, it may be more effective to have them actively analyze their stress and brainstorm ways they can lower anxiety. By printing out free downloadable stress management training tools, you can pass them out to each person to either complete during the session or take home to have private time to complete it. 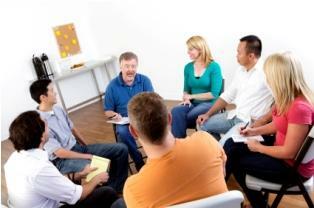 You can choose to have the group members bring their completed worksheets to the next session or not. This depends on how much time you have and whether you will have more than one session. Simply click on the link below and a PDF will open. 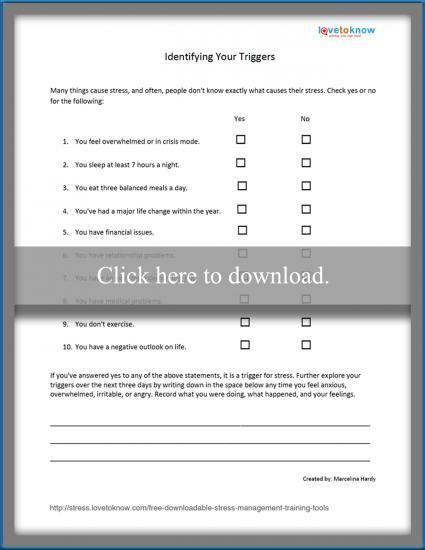 Print out as many copies as you need for your stress management session. If you need help downloading the printable, check out these helpful tips. Since people learn differently, it's important to focus on the different types of learning styles in your training tools. Worksheets are best for people who learn best by reading and processing. Videos help people who are visual learners and lectures best help individuals who learn by listening. Use the free downloadable stress management training tools in conjunction with a lecture about different techniques or triggers, and show a video. If you have several sessions to work with, you can spend more time on each teaching style, but if you don't, break up the time in the session so you have about the same time for each.